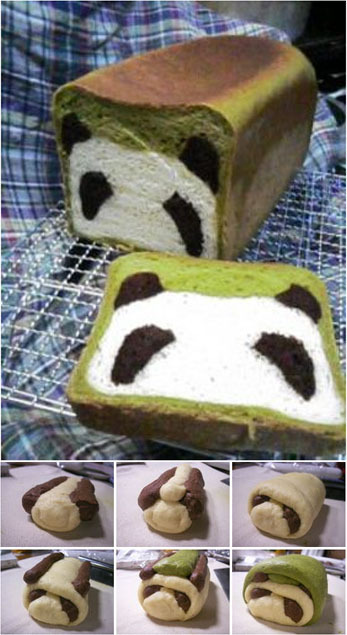 The original recipe is from an Asian website called Taro Taro (which features a photo gallery of user submitted panda bread! ), luckily for those of us who can’t read the site, wlteef.blogspot.com was kind enough to post a translation. The recipe is after the cut! 1. Heat up milk and yolk to temperature of 38C. (I beat the yolk lightly with milk and send it to the microwave on HIGH for 30 seconds). 2. Put everything in bread machine and set to dough cycle. Let it knead for 20 minutes. Stop the cycle and restart the dough cycle and let it knead for another 15 minutes. 5. Prove all 3 pieces of doughs on separate greased plates covered loosely with oiled cling wrap for 30 – 40 minutes. 6. Punch air out of dough and prove for another 20 – 30 minutes. 7. Use 90g plain dough for the face and 2 pieces of 27g chocolate dough for the eyes. (Refer to photo guide in Step (7) in TARO’s site). 8. Fill the hollow of the eyes with 30g plain dough. (Refer to photo guide in Step (8) in TARO’s site). 9. Roll remaining plain dough over the patterned dough. (Refer to photo guide in Step (9) in TARO’s site). 10. Divide the remaining chocolate dough into 2 pieces (17.5g each) for the ears. (Refer to photo guide in Step (10) in TARO’s site). 11. Use 70g of the green tea dough to fill up the hollow between the ears. (Refer to photo guide in Step (11) in TARO’s site). 13. Place dough into a well-greased loaf pan and cover it with a lid and prove for 50 – 60 minutes in an enclosed area eg. microwave oven. 14. Bake at 200? for 25 – 30 minutes. 1. This is not an exact translation of TARO’s recipe because I used the bread machine to help me so the first few steps might be different from TARO’s. 2. For Step (12), I did not wrap the green tea dough all around the patterned dough. Compare my finished product to that of TARO’s, you can see the difference. 3. My first prove is 60 minutes, 2nd prove is 30 minutes and final prove is 60 minutes. 4. I bake at 185C for 25 – 30 minutes.